The new HillTip Snowstriker™ SML-straight blade will be available in three different widths: 2600, 2750 and 3000mm with blade height of 75cm (80cm with optional snow deflector). The snow plow is constructed of high-strength steel that ensures the weight class required for European light truck segment in 7,5ton. The typical carrying vehicle is Mitsubishi Canter, MAN, Iveco and Mercedes Atego trucks in the 7,5t weight class. The snow plow weights 380-410 kg, depending on the model. – Introducing the SML- snow plow is a clear strategic step for our company, which will be followed with other relating products in the near future. 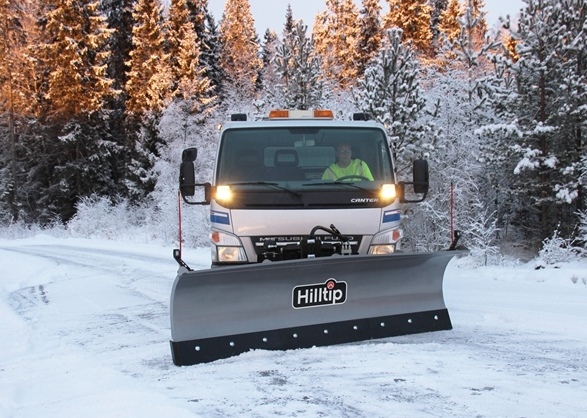 Therefore, we are proud to present our first medium size snowplow; it’s a small but important step to the light truck segment, says Frank Mäenpää, Sales Manager and co-founder at HillTip Oy. The Snow plow is controlled via the trucks communal hydraulics or with electro hydraulic 12V /24V power pack via CAN-BUS, by a 4-position joystick inside the cabin. The power unit has a manifold with solenoid valves and relief valves to protect the cylinders from hard knocks. Thanks to the hydraulics design it also offers a quick swing time, 3 sec. from right to left for efficient snowploughing. – The important thing for us has been to listen to the customer’s demand, and react accordingly, Frank says. Pickups, what works best for snow ploughs and salt spreaders?